I am from a generation that you likely never heard of. We are known as the “silent generation” or the “lucky few”. Born after the great depression but before the end of the second World War. We are the only modern generation who are smaller than the one that preceded it. I was born near its end. I was too young to know that the second world war even happened or that my Father was involved. I was still in grade school when Korea ended. Vietnam was an American war and my view coloured by the dissenters I met who had moved to Canada. The closest I got to war was the 1962 Cuban crisis when as a sailor in the RCN I was recalled from leave and sent to sea as part of the NATO blockade. From then to retirement were pretty much the glory years of the late 20th century and early 21st. My first career at 15 was as an apprentice Ironworker building pulp mills and other large industrial structures. The Navy a short 3 year interlude the avoid a bitter Union takeover dispute came next. On completing basic training at HMCS Cornwallis in Nova Scotia I was then posted to HMCS Lanark in refit at the Point Edward repair base on Cape Breton Island. There I met and am still married to my life partner of more than 50 years. I served in Lanark for the rest of my enlistment. We then moved to Vancouver for work. I worked a while as an auto parts truck driver then in inside sales. City jobs. Quickly realizing my grade 10 education would limit me I returned to ironworking out of town to get the funds to return to school. A college diploma in marketing and sales from the just opened Vancouver City College was acquired. A sales job with a large world-spanning industrial supply company followed. During that time an interest in Politics arose where our VCC class took over the student government wrestling the control of student fees from the administration. I became involved with the Young Liberals, secured a delegate slot in the leadership convention that elected PET and left that organization as President of the BC Young Liberals over the instigation of the War Measures Act. About the same time, I soured on the Corporate world. It was 1970. Early in my life around age 7 or 8 I went sailing on a 40′ schooner and loved it. A sea change occurred. We built then lived aboard, sailed ocean’s, and spent the next 40 years earning a living and having fun. Those years are chronicled here. Now, retired in Cape Breton, I fear for what is likely to come. Concerns for the “common good” no longer seem to apply. 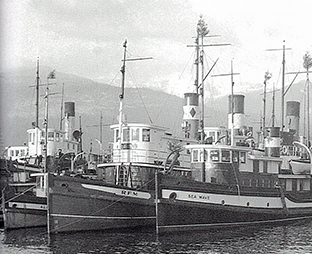 An articulated tug and barge unit joins a tug and barge together with a “knuckle joint”. A large contraption of big moving steel parts to move by wave action and controlled by powerfull hydraulic rams. It is not a new breed of ship. It is just another means of using a Tug to move a barge. Another a is ITB, (intigrated) which uses cables to do the job. More traditional means are lashing along side and most common, towing astern. Today’s news has a story of two women sailors and two dogs lost at sea for five months. Mostly it deals with the rescue by the US Navy thousand of miles in the opposite direction (off Japan) from the stated destination (Tahiti). Wihout more information it is the “lost” part that bothers me. GPS, the global positioning system, has made it simple and skill less as a navigator to cross an ocean. If that is your choice it would be prudent to have a couple of spare stand alone units and a carton of batteries stored away in a waterproof box. Even a small jury rigged sail would have given some control over direction. There has always been risk in crossing oceans in small boats. The skill is to mitigate them. The assumption has to be no one is going to rescue you. Plan for losing your mast or power or both. Oh yea, and in the 21st century satellite based emergency locators have world wide coverage and are registered with who you are and what you are doing. I really liked the part where losing a cellphone over the side first day out was a contributing factor. Note that a category 5 at minimum is twice the force of a category 3 at minimum. A category 3 at minimum is 2.2 times a category 1 at minimum. Since Irma’s velocity squared at its 185 mph maximum of 3.42 is twice the category 4 value of 1.69, it would have achieved Category 6, if their was one.